Venezuela’s economy has been hit hard in recent years by the sharp decline in global oil prices. According to OPEC, oil accounts for about 95 percent of all of Venezuela’s export earnings and about a quarter of its total gross domestic product. Declining oil revenue has sparked an economic crisis in the country, leading to anti-government protests. In an effort to stem discontent, the government has imposed currency controls and limited the prices of key consumer goods—all in an effort to stabilize the economy and limit inflation estimated at about 60 percent. But broad economic policies are felt on the ground as shortages of key commodities and long lines for basic supermarket goods. The unintended consequence of price controls combined with high inflation has led to shortages and hoarding. Meanwhile, the government of Venezuela asserts that the country’s economic collapse has been driven by US efforts to destabilize the regime, once seen as an alternative to American influence in the region. What do you think? What was the primary cause of the crisis? What balance of international and domestic factors explain the crisis? How might Venezuela address its ongoing economic crisis? And how might it be resolved? Like many oil exporters, Venezuela’s economy has been rocked by the recent collapse in global oil prices. According to the Organization for Petroleum Exporting Countries, of which Venezuela is a member, oil accounts for approximately 95 percent of the country’s foreign exchange earnings and about a quarter of the gross domestic product. The steep decline in global oil prices have thus left a major hole in government coffers and a sharp economic downturn in the country’s economy. 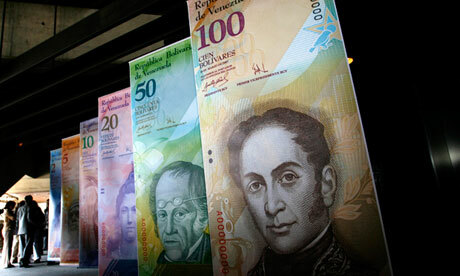 To cope with the ongoing crisis, Venezuela’s government is undertaking a policy to devalue its currency, the bolivar. But the response of global currency markets suggest that the move is too-little, too-late, and that move will have little effect on the value of the bolivar, and that the government’s strategy may be an effort to retain foreign exchange in order to make upcoming loan payments to international creditors. What do you think? Is Venezuela in danger of defaulting on its international debt? What effect would such a default have on Venezuela’s economy? And what effect might a default have on the country’s domestic politics? 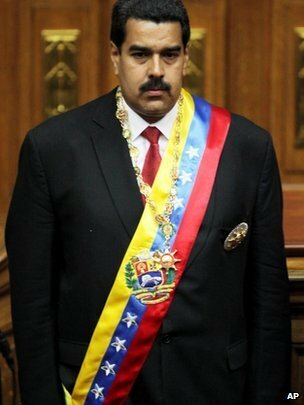 Venezuelan President Nicolas Maduro was sworn into office on Friday. The U.S. government last week announced it would not validate the results of Venezuela’s contested presidential election, in which Hugo Chavez’s former Vice President, Nicolas Maduro, narrowly defeated challenger Henrique Capriles. Capriles’s campaign has called for a recount, but Maduro has refused. And while the Union of South American Nations (Unasur) has called for an emergency meeting to address the situation in Venezuela, many South American states, including Argentina, Bolivia, Brazil, Colombia, and Peru, have already recognized Maduro’s new government. It’s important to note that recognition here is not the same as formal diplomatic recognition, though media reports make it difficult to understand the difference. Diplomatic recognition refers to the formal recognition of states and their governments. States will often use diplomatic recognition as a tool to promote or punish particular actions. The most notable examples of this include Taiwan, which the United States recognizes but China does not. Diplomatic recognition can also take de facto or de jure forms. De facto recognition refers to the informal recognition of a new country. In this sense, Taiwan has de facto recognition by China in so far as China engages in negotiations with the Taiwanese government. But it does not give de jure, or legal, recognition. There is no Chinese ambassador to Taiwan. Similarly, after the Russian Revolution of 1917, Great Britain and the United States offered de facto recognition well before they engaged in the de jure exchange of ambassadors. So if the United States’ decision via-a-vis Venezuela is not referring to diplomatic recognition, what exactly is it referring to? Here, we’re considering whether or not the United States considers the outcome of the election to be reflective of the will of the people? Were Venezuela’s elections, in other words, free and fair? The United States is effectively asserting they were not, and the government that resulted from them thus lacks legitimacy (and by extension, recognition). What do you think? Should the United States withhold recognition of the new Venezuelan government? Are Venezuela’s most recent election results reflective of the will of Venezuela’s people? Take the poll or leave a comment below and let us know what you think. The government of Venezuela last week cut the value of its currency, the bolivar, by 32 percent against the U.S. dollar. The move, intended to boost the economy’s sluggish performance, was the fifth devaluation by Hugo Chavez’s government since 2003. Governments usually devalue their currency in an effort to address balance of trade disparities. Because most commodities (including Venezuela’s primary export, oil) are priced in U.S. dollars, devaluing the local currency boosts exports and cuts imports. A country that exports more and imports less will experience an improvement in their balance of trade and a reduction of their trade deficit. But will it work? Devaluation generally works best when the country is exporting commodities for which there is steady demand and importing luxury goods. Countries which depend heavily on imports for basic commodities like food or gasoline will often not benefit from devaluation, because in the relative increase in the cost of imports offsets any increase in exports. This was the case, for example, when Rwanda devaluated the Rwandan franc in 1993. Because Rwanda exported primarily coffee (for which there was already excessive supply) and imported foodstuffs, devaluation of the Rwandan franc failed to result in any real improvement in the economic situation in the country. Venezuela, on the other hand, exports primarily oil and imports primarily machinery and construction materials, suggesting devaluation may have a positive effect. But Venezuela also faces some real challenges. The Venezuelan bolivar was already trading at four times the official exchange rate on the parallel market, suggesting that even with the recent devaluation it remains overvalued. And price controls have left many basic consumer commodities in short supply. Still, Venezuela is in far better straits than Zimbabwe, which last week reported that the country had just $217 (yes, that’s $217.00, not $217 million, or even $217 billion) in its coffers. What do you think? Will Venezuela’s devaluation of the bolivar help turn the country around? Or is it too little, too late? Take the poll or leave a comment below and let us know what you think. President Barack Obama has been busy on the diplomatic front this week. On Thursday, Obama announced his administration would cancel President George Bush’s proposed deployment of a missile defense system to Eastern Europe. The missile defense system would have involved deployment of radar systems to Poland and the Czech Republic, a move which the Russian government insisted undermined its own national security and necessitated the expansion of its missile systems into Eastern Europe. Although the Russian government denied there was a quid-pro-quo agreement for the U.S. move, the Obama administration is hoping that the change in U.S. policy will help improve relations with Russia and lead to greater cooperation in other areas, including addressing the situation in Iran. However, Russian Prime Minister Vladimir Putin responded to the announcement with a demand for greater U.S. concessions, including support for Russian membership in the World Trade Organization, leading some analysts to speculate that the United States had miscalculated if it believed that its policy change in missile defense would result in a dramatic shift in Russian policy. On Saturday, the White House announced that President Obama would hold a joint meeting with Israeli Prime Minister Benjamin Netanyahu and Palestinian President Mahmoud Abba on Tuesday. Obama hopes that the meeting will restart peace talks, which reached an impasse last year. U.S. Special Envoy for the Middle East, George Mitchell, has been engaged in shuttle diplomacy to address the stalled talks for more than a week, but Netanyahu remains under domestic political pressure not to make any concessions on the expansion of Israeli settlement activity in the West Bank, a key obstacle for the Palestinians. 1. Last week’s meeting of the Central Committee of the Chinese Communist Party raised questions about who will succeed Hu Jintao as the country’s leader. Most analysts had believed that Vice President Xi Jinping was Hu’s heir apparent, poised to take control of the party (and the country) after Hu steps down in 2012. When Xi was named to the Politburo in 2009, it was assumed that his elevation would follow the same path as Hu’s. Hu’s political power rests in his control of three offices: Secretary General of the Communist Party, President of China, and Chairman of the Central Military Commission. Xi was expected to be nominated to succeed Hu as Chairman of the Central Military Commission on Friday, but no announcement from the Central Committee was forthcoming. Although some analysts believe that Xi’s appointment may be announced at a later date, others believe that Hu may be trying to retain control of key positions, including head of the military, after his 2012 retirement. 2. Efforts to resolve the political crisis in Afghanistan continued over the weekend, as closed-door meetings between foreign envoys, opposition leaders, and representatives of President Hamid Karzai discussed the future of the country. Although President Karzai was declared the winner of last month’s presidential elections by the Afghan elections commission, most observers believe that the vote was badly flawed, with the European Union suggesting that as many as 1 million of Karzai’s votes (which would represent more than ¼ of all votes cast in the election) should be viewed as suspect. Seeking to address the political standoff, the West is pushing for a power-sharing agreement in Afghanistan that would see Karzai claim the presidency but would considerably weaken the office, transferring significant political authority to appointed technocrats. 3. On Thursday, Islamic insurgents launched a suicide bomb attack against African Union peacekeeping forces in Somalia, in a move retaliating against a U.S. strike that killed Saleh Ali Saleh Nebhan, a suspected al-Qaeda leader. The African Union force, comprised primarily of Ugandan and Burundian soldiers, remains understaffed despite being responsible for addressing the threat posed by Islamic radicals intent on toppling the fragile government. 4. The government of Venezuela has been busy courting foreign assistance in developing its oil production facilities. The Venezulan government last week announced the discovery of a “very large” pocket of natural gas offshore, following a similar announcement by the government of Brazil. The Venezulean government announced that it had signed a $20 billion deal with the Russian government and a $16 billion with the Chinese government to expand oil production in the country by as much as 1.35 million barrels per day. 5. The campaign around the Irish ratification vote on the Treaty of Lisbon, scheduled for October 2, has entered full swing. Charlie McCreevy, Ireland’s European Commissioner, delivered a strongly-worded speech to the business community in Dublin suggesting that “international investors would take flight” from the country if it rejected the Treaty. The Treaty, viewed as vital to the continued growth and expansion of the European Union, was rejected by Irish voters in 2008, sparking a furious round of diplomacy to get the Treaty passed. But many observers are forecasting another no vote by Ireland in October could lead to the defeat of the Treaty in other Euroskeptic countries, including Poland and the Czech Republic. The political situation in Iran continued to evolve over the past week. Last week, a standoff between President Mahmoud Ahmadi-Nejad and Iran’s Supreme Leader, Ayatollah Ali Khamenei, culminated in the dismissal of two conservatives from the cabinet and the firing of Vice President (and close ally of Ahmadi-Nejad), Esfandiar Rahim Mashaei. The deteriorating relationship between Ahmadi-Nejad and Khamenei further undermines the political stability of Iran, already weakened by June’s disputed presidential elections and the subsequent protests which have rocked the country. Protests have been a regular feature of the Iranian political scene for the past month, including clashes between police and opposition supporters like those that occurred on Thursday. Although the Iranian government last week released hundreds of people arrested for participating in the post-election protests, the trial of 100 of the most prominent detainees is moving forward. Critics of the regime have condemned the trial as a spectacle. Meanwhile, three Americans were arrested on Saturday by Iranian security forces for allegedly entering the country illegally. The three were camping in Kurdistan (near the Iraqi-Iranian border) when they crossed over into Iran. They have been transferred to the capital, Tehran, where they are currently being held. 1. Two statements by the Indian government last week dashed hopes of progress in multilateral negotiations. On Wednesday, India’s commerce secretary, Rahul Khullar, dismissed hopes of rekindling World Trade Organization talks as unrealistic in the current global political and economic climate. The current round of talks, referred to as the Doha agenda, has been under negotiation for nine years. The talks have been suspended numerous times, largely as a result of the inability of WTO member states to agree on binding cuts to agricultural subsidies. According to Khullar, progress is unlikely because, in the context of the global economic crisis, political leaders are focused on job losses and the lack of domestic economic growth, a focus which makes it difficult to move forward on a new global trade deal. In another development, India’s environment minister, Jairam Ramesh, said on Friday that India would not agree to binding emission cuts for at least ten years, potentially throwing climate talks scheduled to take place in Copenhagen in December into disarray. India and China are both dismissive of western pressure to agree to greenhouse gas reductions, believing that such reductions would undermine future economic growth and development in their countries. But without the participation of China and India in climate change negotiations, progress will be far more difficult, particularly given the historical U.S. negotiating position that it will not be bound by any climate change agreement that does not also include reductions for China and India. 2. Over the weekend, Russia concluded negotiations to expand the Russian troop presence in Kyrgyzstan. The expanded Russian presence is part of Russia’s broader effort to reassert itself in its traditional sphere of influence, an effort which included the development of the Collective Security Treaty Organization, a counterpart to NATO which includes Russia and six other former Soviet Republics, Kyrgyzstan, Kazakhstan, Tajikistan, Uzbekistan, Armenia and Belarus. The United States and Russia have been competing for influence in Kyrgyzstan, which occupies an important geo-strategic position, and Kyrgyzstan’s president, Kurmanbek Bakiyev, has skillfully negotiated between competing Russian and American interests. In February, after receiving $2 billion in aid from the Russian government, Bakiyev ordered the United States to leave Kyrgyzstani bases by June. The bases are part of the U.S. air transit route to supply forces in Afghanistan. After the United States agreed to triple rent payments for use of the base and to offer additional financial assistance to the Kyrgyzstani government, Bakiyev rescinded his request that the U.S. withdraw. 3. Venezuelan President Hugo Chávez has once again sparked widespread criticism, this time among human rights groups. At issue is the latest development in the president’s campaign against “media terrorism”—a new law which would punish journalists and their sources with up to four years in jail for “causing panic,” “disturbing social peace” or compromising national security. In an unrelated development, the government of Venezuela has “frozen” diplomatic and economic relations with its neighbor, Colombia. Relations between the two countries have been poor since March 2008, when Colombia launched a raid into Ecuador, a close ally of Venezuela. The decision to suspend relations came after Colombia accused Venezuela of supplying rocket launchers to Marxist rebels in Colombia. 4. Clashes between security forces and an Islamist sect in three states in Nigeria continued last week despite the death of Islamist leader Mohammed Yusuf in police custody. More than 150 people have died in five days of fighting in Nigeria, where a sharp economic and political divide between the largely Muslim north and the predominately Christian south has been exacerbated by the country’s declining economic situation. The fighting in the northern part of the country complicates efforts to address the longstanding crisis in the southern, oil producing region of the country, where conflicts between militant separatist groups and the government have continued off-and-on for the better part of a decade. Taken together, these conflicts represent the most significant challenge to the Nigerian government since independence. 5. The International Monetary Fund on Friday issued a statement intended to play down the standoff between the Fund and the government of Iceland. At issue are the conditionalities imposed on the government of Iceland as a requirement for the dispersal of $2.1 billion in IMF loans. The government of Iceland has been under immense political pressure regarding the status of foreign savings deposits in Icelandic banks, which collapsed last year as part of the global economic crisis. The IMF is requiring that the government guarantee all foreign savings deposits, but the government of Iceland has so far refused, bowing to domestic political pressure not to compensate account holders. The turmoil over last week’s Iranian elections continued into this week, with thousands of people defying a statement by the country’s spiritual leader, Ayatollah Ali Khamenei, and orders by President Mahmoud Ahmadi-Nejad and the country’s Revolutionary Guard banning such protests. Over the weekend, hundreds of supporters of Mir-Hossein Moussavi were arrested during protests. Moussavi’s supporters believe the election was rigged, but international observers and foreign governments have so far refused to comment. 1. The World Bank issued a statement urging the developed world to focus on the global economy in their recovery efforts. The collapse of global credit markets over the last year, the Bank noted, had led to a dramatic decline in private capital flows, with investment in developing countries declining from $1,200 billion in 2007 to an estimated $363 billion this year. Meanwhile, announcement of the new stimulus package by the Chinese government led the World Bank to increase its forecasts for the Chinese economy this year. But the decision of the Chinese government to include a ‘Buy China’ policy in its stimulus package has led to increasing tensions over the specter of protectionism in the global recovery effort. 2. French President Nicolas Sarkozy gave a rare address to the country’s parliament at the Palace of Versailles this week. For more than 130 years, the French President had been constitutionally prohibited from entering parliament—an attempt to ensure legislative independence. But after the constitution was amended last year—in the name of increasingly parliamentary oversight—the restriction was removed. French Green and Communist parties boycotted the speech in protest of what they see as an attempt to increase the power of the French presidency. Sarkozy used the opportunity to outline measures intended to address the problem of rapidly detiorating public finances, sparked by the global economic crisis. In the speech, Sarkozy rejected the introduction of austerity measures, instead focusing on the need to protect jobs. 3. The situation in Iraq deteriorated over the past week, as the number of bombings as increased. On Saturday, a large truck bomb exploded outside a Shi’ite mosque in the Kurdish town of Kirkuk. The attack, the deadliest single attack in more than a year, killed 73 people. Meanwhile, a series of smaller attacks in Baghdad killed 15 people on Monday. The declining security situation comes as the United States prepares to begin its withdrawal from Iraqi towns, handing responsibility for day-to-day security over to Iraqi police by the end of June. 4. The speaker of the parliament in Somalia has issued a call for neighboring countries to send in troops to help prop up the country’s fragile government. The security situation in Somalia remains grim. On Thursday, the government’s security minister, Omar Hashi Aden, and more than 20 others were killed in a suicide attack by Islamic militants known as al-Shabaab. Al-Shabaab seeks to overthrow the country’s western-backed government and impose its vision of strict sharia law in Somalia. So far, international assistance has been limited, and al-Shabaab has confined the influence of the government to the country’s capital, Mogadishu. Meanwhile, according to United Nations estimates, some 122,000 civilians have been forced to flee as a result of fighting which began in early May. 5. Tensions between the government of Hugo Chávez and the anti-government television station Globovisión have increased in Venezuela in recent days. Chávez accuses the station of “media terrorism” as a result of its critical coverage of his government, particularly following a minor earthquake which hit the capital, Caracdas, in early May. According to observers, the station makes an easy target for Chávez, who has stepped up his efforts to transform Venezuelan society and economy in recent months.